Heat the quinoa and water in a 2-quart saucepan over medium-high heat to a boil. Reduce the heat to low. Cover and cook for 15 minutes or until the quinoa is tender and the water is absorbed. Remove the quinoa to a large bowl. Let cool for 20 minutes. Add the eggs, garlic, bread crumbs, salsa verde, queso fresco, red pepper, cilantro and cumin to the quinoa and mix well. 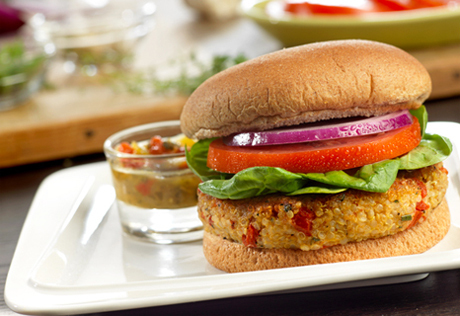 Using wet hands, firmly shape the quinoa mixture into 8 (3/4-inch thick) burgers. Heat half the oil in a 12-inch nonstick skillet over medium heat. Add 4 burgers to the skillet and cook for 4 minutes or until well browned on the bottom (you don't want these to stick, so make sure the skillet is hot before adding the burgers and don't turn them too soon). Turn the burgers over and cook for 4 minutes or until well browned. Remove the burgers from the skillet. Repeat with the remaining oil and burgers. Divide the burgers among the buns and top each with 1/4 cup spinach, 1 slice tomato, 1 slice onion and additional salsa verde, if desired. Recipe Note: You can also cook the burgers in a regular skillet. Heat 1 tablespoon olive oil in the skillet to cook each batch of 4 burgers. Alternate Preparation: For a more hands-free cooking option, these burgers can be baked. Heat the oven to 400°F. Place the burgers onto a baking sheet lined with parchment paper. Bake for 15 minutes or until the burgers are lightly browned and hot.